These days hair plays a paramount role in people’s appearance. That is also one of the reasons for them to take care of this. But when it comes to healthy hair care, you need to know something about the way it works, especially the hair cuticle. Understanding the hair cuticle means you are nearly aware of your hair enough to take care of it yourself. 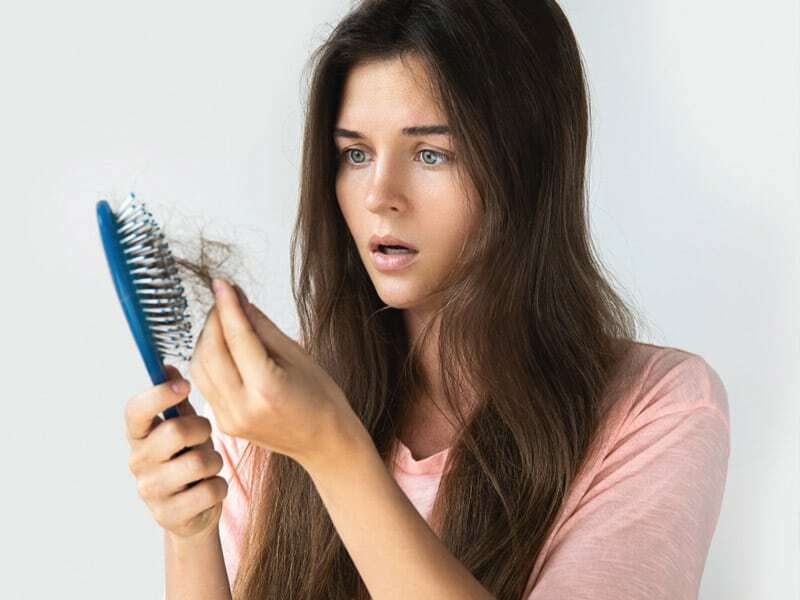 What hair cuticle is, how important it is, and how to deal with hair cuticle damage are three things we mention in this article. 1. What is hair cuticle? 1 1. What is hair cuticle? 1.1 What is the function of hair cuticle? 1.2 Where is hair cuticle in hair diagram? 2 2. How important is hair cuticle? 3 3. What is hair cuticle damage? 3.1 What causes damage to hair cuticle? 3.2 How can hair cuticles be damaged? 4 4. How can we fix the damages on hair cuticles? Hair cuticle damage usually comes from wrong caring ways that we use for our hair cuticle. To fix them, the first thing you need to know is the definition of the hair cuticle. What is the function of hair cuticle? Hair cuticle is the outside layer that defends a hair strand from harmful environmental factors. The cuticle resembles shingles on a roof in the way that its different layers overlap. Additionally, the protein scales of the cuticle overlap to ensure the moisture of the hair strand. The cortex is what hair cuticle protects. This dictates all of the attributes of a hair strand including its color, texture, curl pattern, thickness, and so on. Hair cuticle function is to protect cortex from suffering damaged, keeps the hair dampened and strong. Where is hair cuticle in hair diagram? In hair diagram, a hair strand includes three layers: cuticle, cortex, and medulla. The medulla is the core of hair and in some case, it may be absent. Next, there is a second layer called cortex, and the outside layer covering it – cuticle. This layer is transparent and working as a protective scale. Look at the hair cuticle diagram to understand this structure more clearly. 2. How important is hair cuticle? The functions and diagram beneath say a lot about the importance of the hair cuticles. If you cannot realize, I will say this: When your hair cuticle is strong and healthy, your hair is strong and healthy. Hair cuticles prevent bad conditions from damaging the inside of hair strands. If this layer is destroyed, your hair will totally dead. When closed, the hair cuticle can prevent moisture-loss as well as act as a shield to protect against damaging environmental forces. 3. What is hair cuticle damage? Hair cuticle damage is what you usually get if you take care of your hair the wrong way. When the hair cuticle is damaged, the tough structure no longer holds the hair together and the hair fibers dislodge and split. What causes damage to hair cuticle? There are many things that can damage your hair cuticle. Let’s see what they are. On the surface of the hair cuticle layer is a layer of hair’s natural oils. When you wash your hair, the shampoo strip the hair of its oil. If your shampoo is too strong, it will injure the cuticle by tearing up the overlapping scales. Try other milder shampoo. When you touch your hair too much, you are also causing damage on your hair cuticle. Ponytail holders, combs and clips can eventually wear away the hair cuticle if you use them day by day. Many women usually create different hairstyle by applying heat on their hair. Unfortunately, this is also ways to destroy their hair cuticle. The heat lifts the overlapping scales where water and other substances can enter. It also removes pieces of cuticle, which causes a porous surface that results in weakened hair. Everyone likes going swimming, but Chlorine found in swimming pools and the salt found in the ocean can damage your hair cuticles, so take it into consideration. How can hair cuticles be damaged? Hair cuticles are the most exposed components of hair strands which suffer the pressure from the outside condition. 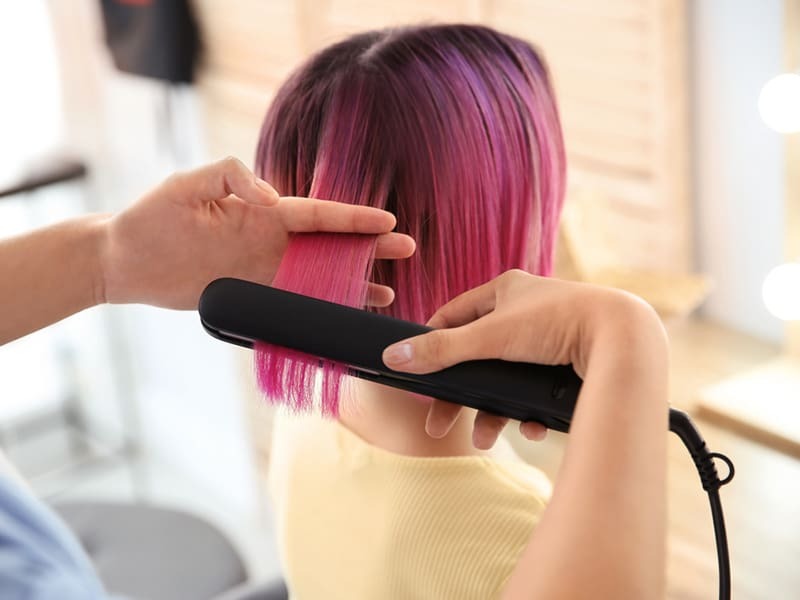 When hair is heated, water evaporates extremely outside and inside the hair. As a result, there is a change happening within the cortex. A 1998 study published in the “Journal of Cosmetic Science” looked at the use of blow dryers on wet hair showed a clear result of this. The cracks appear when the hair cuticles undergo a drastic reduction in water hydration status. The cracks occurred all the way through the three layers of hair. The outer cuticles became brittle, rigid and cracked from the swelling pressure of all three layers. 4. How can we fix the damages on hair cuticles? The best way to treat the hair with damaged cuticles is avoiding causes. Have you ever have your hair’s end split? This is when your hair starts to break. In this case, you ought to trim your hair. Although this cannot prevent the damage, it can keep your hair’s state from getting worse. The less you touch your hair, the better it would become. You should avoid touching or even brushing it if you want it to stay healthy. Do not wash your hair too often, twice or three times a week is the best, and remember to use a mild shampoo. Additionally, if possible, avoid chemical treatment, dying or applying heat on your hair. 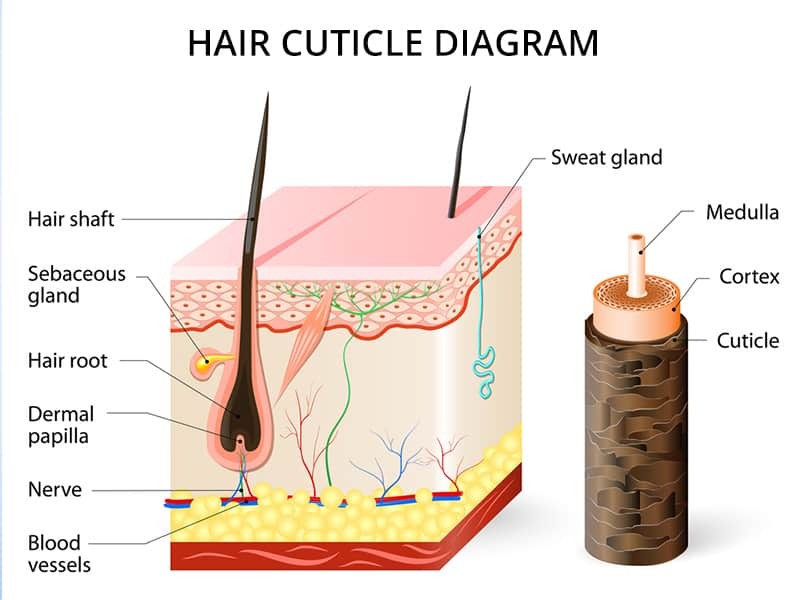 After you read this article, I hope that you will know something about hair cuticle, its function, the way it works, its damage and how to fix hair cuticle damage. 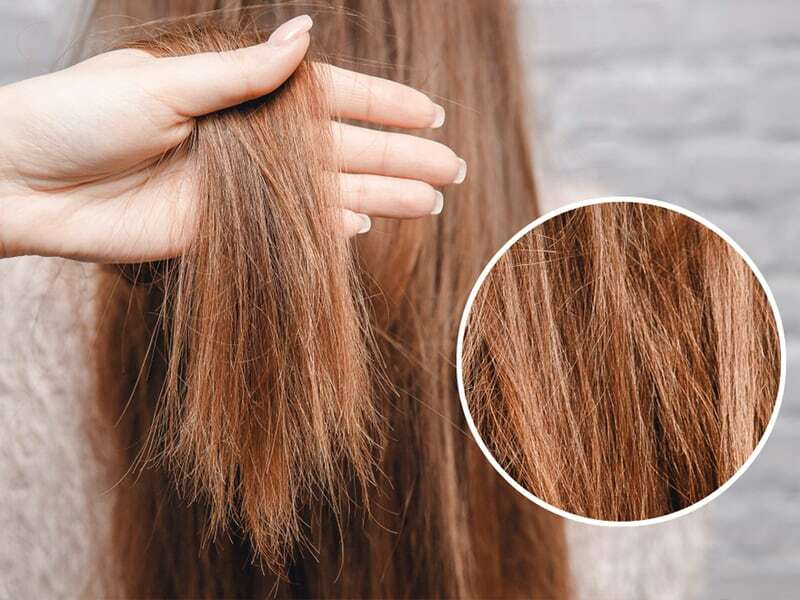 The important role of hair cuticle is undeniable so you need to avoid doing things that have negative effects on this layer and take care of it the right way to keep your hair’s beauty. Don’t forget to check out Layla Hair website to get updated tips and advice on hair care and styles!